When you have uPVC fixtures fitted to your windows and doors, they can sometimes get accidentally damaged. This is especially true when heavy objects such as ladders fall over and splits the uPVC apart. Not only does a damaged window or door look terrible, but it can be off putting to potential buyers if you are trying to sell or rent your property. DG Servicing employ skilled uPVC restoration specialists that have the expertise to restore your UPVC windows and doors back to their former glory. 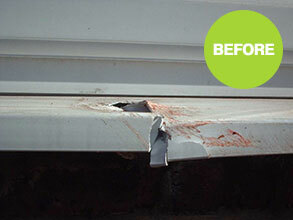 If you would like to know what our repairs will look like, then check out the before and after photographs below. 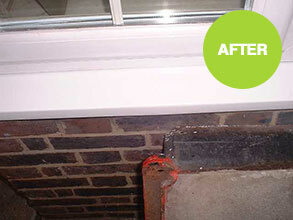 As you can clearly see, the uPVC appears as good as new!. If you would like a free quotation for UPVC repairs to be carried out on your property, then contact us for help.